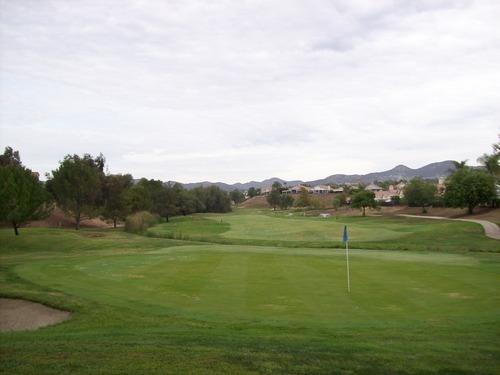 This Murrieta course used to be called The Colony and was a par-65 “executive” layout at one time. 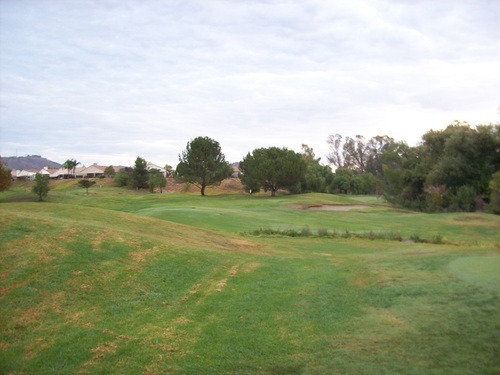 However, they updated the course and stretched it into a “regulation” par-70 track. And somewhere along the way, they decided to rename it California Oaks. I played out here this morning and it was my first time at this course. 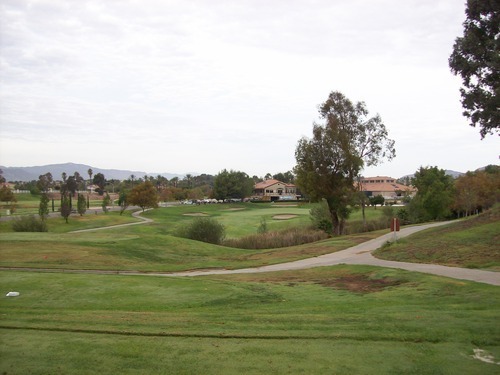 I am not familiar with how the course used to play as an executive layout, but I could definitely notice many places where they had to shoehorn in new tee boxes and fairways in order to lengthen the course. I had a 7:07 tee time, but showed up a little early. The pro shop was a bit disorganized with one poor kid running the whole show (checking in players, getting carts out and ready, taking phone calls for tee times, etc.). Luckily, it wasn’t busy at all, so once I checked in I just went out right away to the first tee by myself around 6:45. I played through a twosome on the 2nd hole and then cruised around after that. It was only about a two-hour round, which was nice. This is a fun and funky little course that was slightly better than I expected. I wouldn’t go too far out of my way to play it again, but it would be a good place for a tune-up round to work on your accuracy and irons. 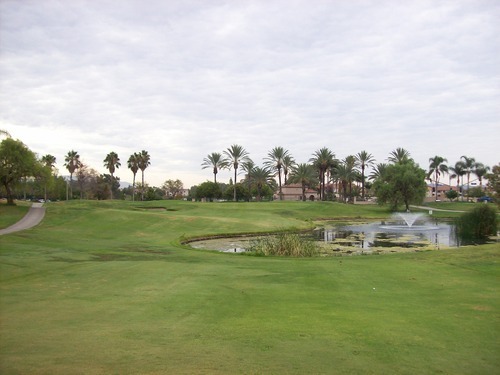 It’s a short and tight course with trouble in play on every hole. Most guys will just want to leave their drivers at home because all the par-4s are short and the two par-5s are both short (but not easy). When they lengthened this course to make it a par-70, you can definitely tell they had to push the envelope a bit on a few holes (especially the par-5s). Both par-5 holes feature blind tee shots from the tees and the 462-yard 7th hole is one of the most maniacal little holes I’ve ever played. 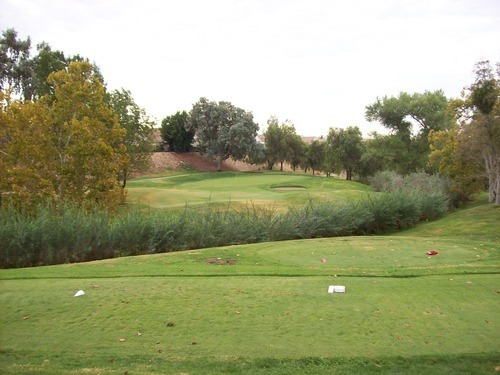 There’s a completely blind tee shot to a very narrow fairway. 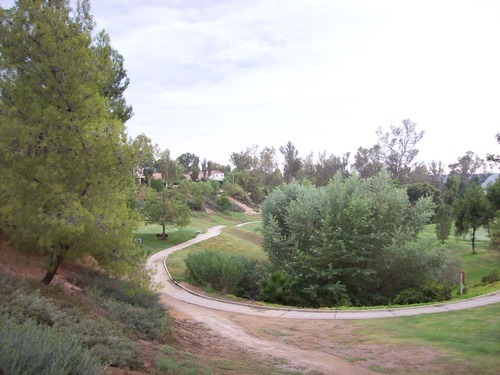 There are trees and OB stakes up the left side and a creek/hazard along right side. 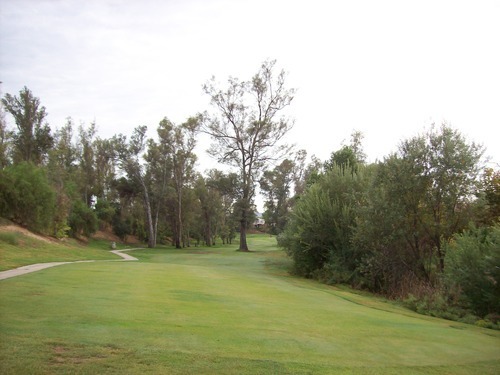 The next shot is down a super skinny fairway with a big eucalyptus tree right in the middle. This is one hole (and there are quite a few others here) where a little local knowledge can go a long way. 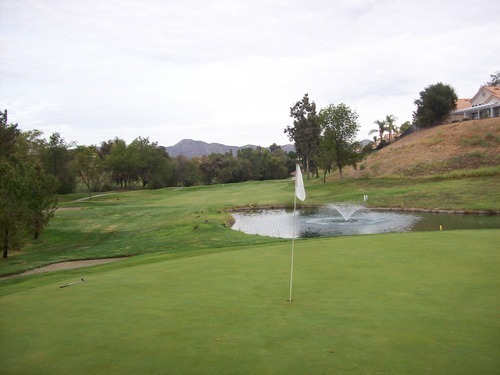 If I do play here again, my strategies will definitely be different on several holes. 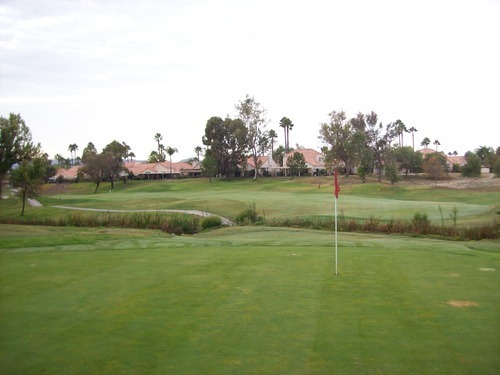 Otherwise, as long as you keep the ball in play, the greens are very accessible and you can post a low score because you’re hitting mostly short irons and wedges into these very receptive greens. This course is probably too short and funky to be taken too seriously by low handicappers, but it is what it is and I kind of had fun trying to figure it out on the fly. I, myself, had very mixed results and I lost several balls. I could blame a couple of those on a lack of course knowledge, but there were some poor shots, as well. The course was greener than I expected this late in summer, which was a pleasant surprise. I wouldn’t say the conditions were “great” by any stretch, but definitely better than anticipated. It was quite soggy out there this morning. The tee boxes weren’t too beat up, but they were kind of lumpy so it wasn’t always easy to find a good stance. 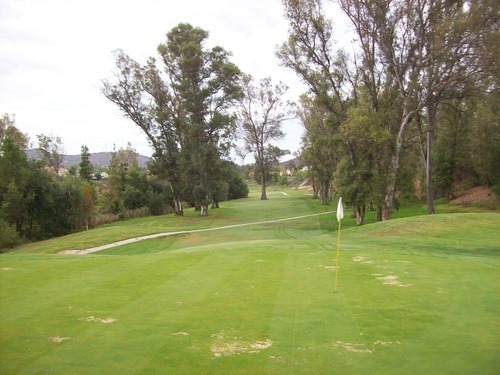 The fairways were lush and green for the most part with some scattered bare/muddy areas throughout. They did seem to be doing some work on the 12th fairway, so it was quite shaggy and playing as cart-path-only. The rough was a mixed bag with some very deep grass in some areas and some big bare/muddy areas, too. I was in one fairway bunker and it was super wet and super packed down, so I just tried to pick it as clean as possible. 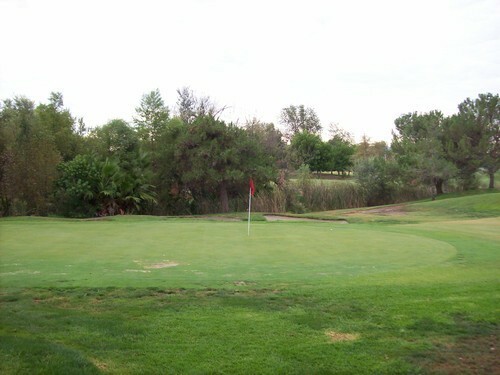 The greens were extremely soft, spongy and SLOW. There were some burnt out (dead and/or diseased?) spots on all the greens, but they had the pins in places that mostly took those poor areas out of play. The greens rolled very smooth on putts even though they were so slow. 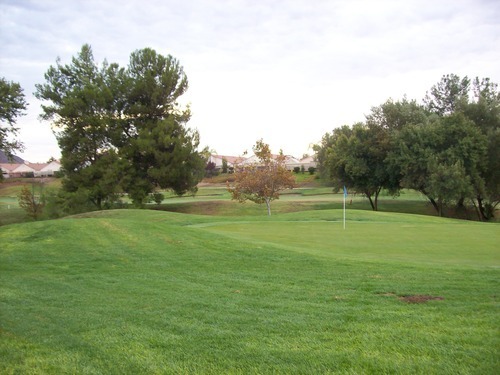 Despite the soft conditions, there were hardly any unrepaired ball marks. That was surprising since all my shots left huge muddy craters I had to fix up as well as possible. Finally, here’s a view from behind the green to show how tight this hole is until you get up near the green. 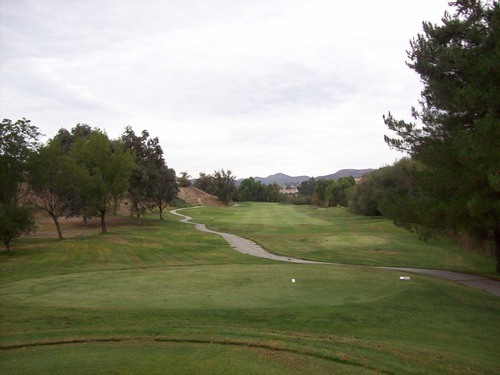 One thing to note is that California Oaks represents the 248th course that I have played. I’m trying to squeeze in a few cheap options as I prepare for a more costly “celebration” of number 250 next week. 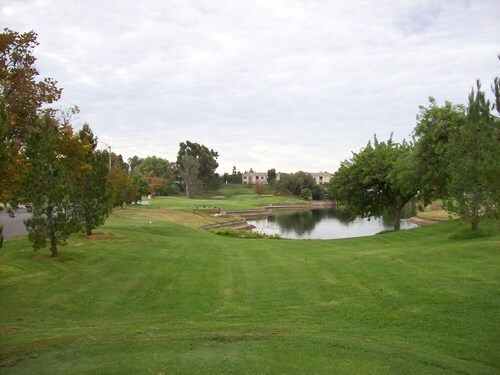 I’ll be playing San Bernardino Golf Club tomorrow, which isn’t anything too desirable. 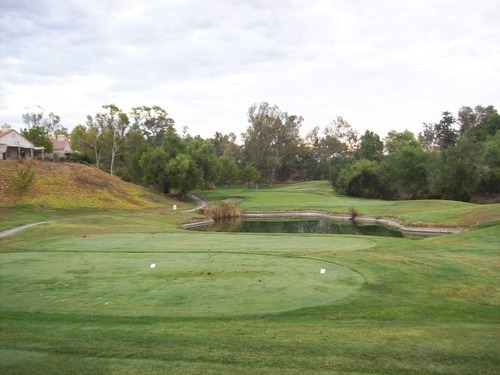 It’s more of an affordable “checklist” option and a warm-up round for a more enticing event tomorrow afternoon at Oak Quarry, which I am definitely looking forward to as one of Southern California’s most unique and enjoyable courses. I have played Oak Quarry before, so it doesn’t count as “new” to the list. So San Bernardino will represent #249 and then I have something much more exciting planned for the end of next week as #250 and beyond. I’ll be hitting the road Thursday and Friday and heading up the coast. 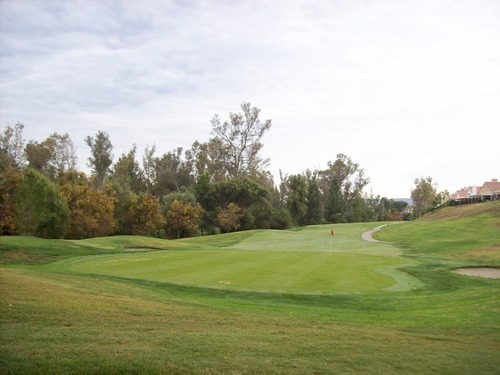 I’ll reveal which courses I’ve decided to play later, but it should be a fun and noteworthy trip that will ultimately culminate in another Greenskeeper.org event on Saturday at Monarch Dunes in Nipomo.